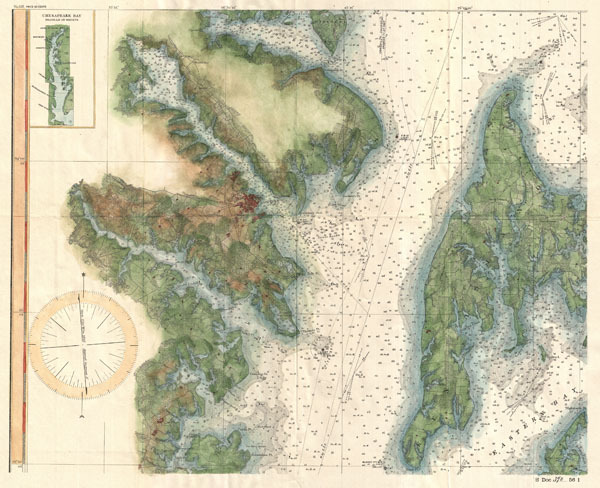 This is 1895 edition of the U.S. Coast Survey chart of the Chesapeake Bay around Annapolis. Cover the Chesapeake Bay from the Magothy River in the north to the Choptank River in the south and extends east ward as far as Eastern Bay and Claiborne. Includes the city of Annapolis, Maryland, home to the U.S. Naval Academy. Offers superb detail both inland and throughout the Bay. This is part of a six chart series covering the entire Chesapeake Bay. The series is numbered from 131 to 136, this being map 135.